"Delicious vegetable lasagna with a white creamy sauce. A family favorite!" Melt margarine in a skillet over low heat; cook and stir flour, salt, and pepper into the melted margarine until smooth and bubbling, 2 to 3 minutes. Add milk and broth into flour mixture, stirring constantly; bring sauce to a boil. Stir wine into sauce and remove from heat. Stir Parmesan cheese into sauce until smooth. Whisk ricotta cheese, egg, and egg white together in a bowl. Heat olive oil in a skillet over medium-high heat; saute carrots, zucchini, and spinach until just becoming tender, 5 to 10 minutes. Stir vegetable mixture into ricotta mixture. Layer 1/3 the lasagna noodles, 1/3 the ricotta-vegetable mixture, and 1/3 the Parmesan sauce in a 9x13-inch baking dish; repeat layering 2 more times with remaining ingredients, ending with a layer of mozzarella cheese. Bake in the preheated oven until cheese is lightly browned and bubbling, about 30 minutes. 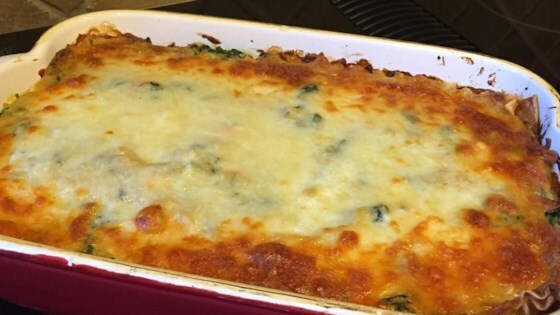 Layers of flavors make this 5-star lasagna a hearty hit. Make this recipe ahead of time and store in refrigerator. Also, freezes well for a healthy instant dinner on a busy night! Great recipe. But I recommend adding garlic to the veggies and extra mozzarella to the layers. While it was good it needed more sauce and flavour. I loved the vegetables though! But not sure if we would try this recipe again. Loved it! Perfect when topping with a little salt and parm cheese! I added broccoli - mixed it with carrot -- and stirred it into the white sauce. Very good, excellent recipe and easy to make. I did it w/ gluten free noodles and it came out great. This is the best white lasagna I have ever had. May never go back to the tomato-meat one again. No change to recipe, just used an oval dish. Deliciousness!